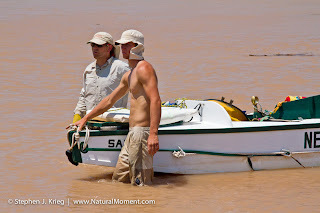 "Imagine, two glorious weeks on the river in Grand Canyon, running every rapid, with perfect weather, passengers, and crew. Thanks to Joy, Sheri, John, Steve, and Zoe for setting it up and allowing us to 'customize' our trip and group. The on-river crew was exceptional: safe, hard working, gracious, entertaining, and always available to meet our requests, however silly at times. Jamie provided strong, confident leadership, as Cliff, Cassie, Drew, Rachel, and Ethan complemented each other perfectly in skill and personality. Special thanks to Greg Reiff for his river passion and sharing his "Sandra" with us and everyone else on the river. Riding "Sandra" is an experience that should continue. Dr. Tom Myers provided a comfort level for our group, both as a physician and boatman, assuring our aging participants that all aches and pains would be taken care of. Thanks again for the trip and all the memories." The July oar trip is on the river now. The August trip, the "River History Special with Roy Webb" departs August 25.